This was one of those recipes that was formed in my mind first and that I had to bring to life. I had the image of a white frosted cake with sugared cranberries on top. 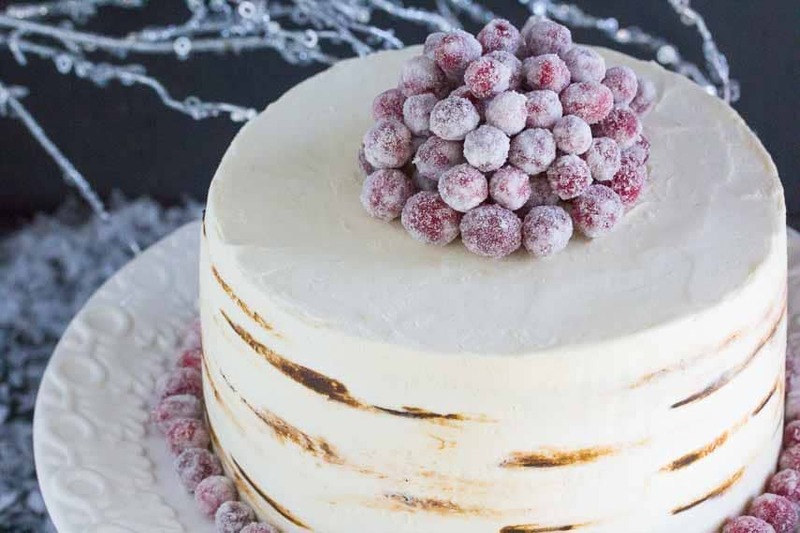 And then your huge, positive response to our other Red Velvet Cake inspired me to re-purpose it and voila – our White Chocolate Red Velvet Cake with Sugared Cranberries was born. At first, I was going to go with a “naked” look, with the frosting applied thinly to the sides, allowing the cake to show through, and you absolutely could do that. I ended up mimicking a birch tree, but certainly the “naked” approach or even just an opaque, smooth application of the frosting would work, too. This one is big, and grand and a showstopper for your holiday table. It is perfect for birthdays that happen around this time of year, too. Don’t shortcut those December birthdays! Like many fancy party cakes (like our Chocolate Chestnut Bûche de Noël), there are a few components, so your prep time needs to be juggled. Thankfully, there are many steps that can be broken down and components made ahead. The Cranberry Filling can be made 3 days ahead and refrigerated. The cake can be made the day before serving, as can the frosting and Sugared Cranberries. In fact, I like completing the cake through the frosting stage the day before so that the filling, cake and frosting have time to meld together. I suggest applying the Sugared Cranberries décor on the day of serving. Let’s break it down. 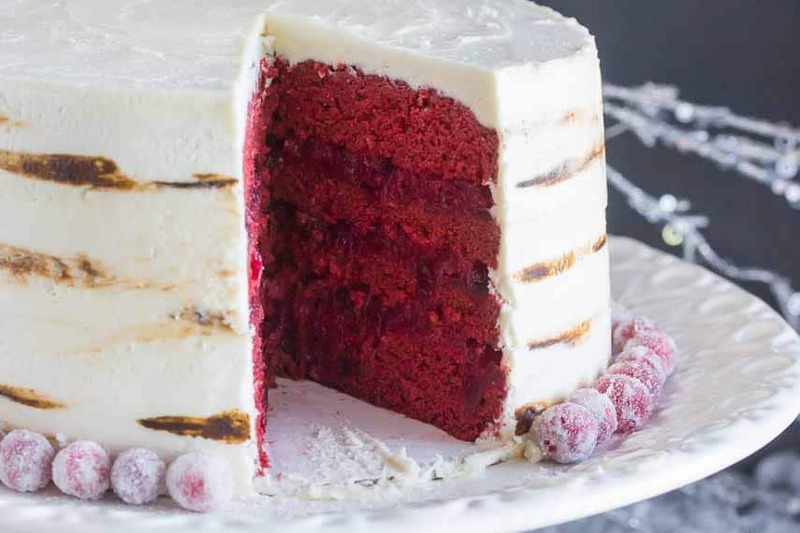 The cake is the same as our other Red Velvet Cake, except it is in larger proportions, in order to make a grand, tall cake. (For the record, it is 1 1/2 times the original recipe, but baked in the same 8 inch/20 cm pans). The filling is like a cranberry sauce, enriched with a little butter and cornstarch. The white chocolate cooked frosting is the same as our previously presented cooked vanilla icing, but this time it is made even more decadent with white chocolate. (It was originally featured in our red velvet cake that was reviewed with Monash researchers). 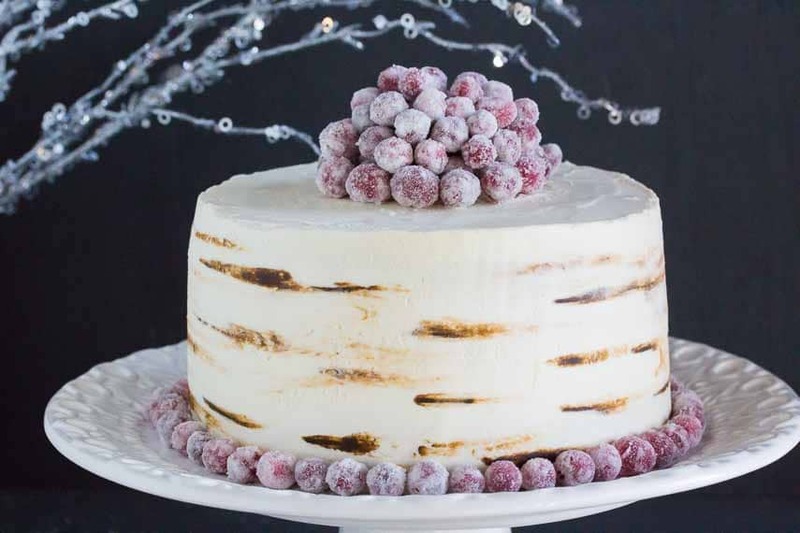 Note that the Sugared Cranberries on the very top of the cake are mostly for decoration and are not considered part of the serving size wedge of cake. 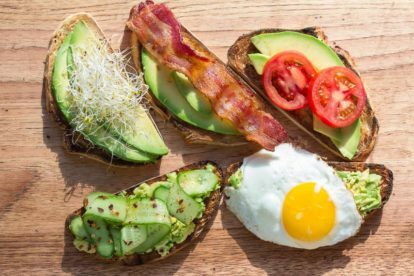 They are edible; they just might tip your FODMAP intake into overload territory. Know your own limits! As you can see in the image of the slice, we removed them before cutting into the cake – otherwise they will roll all over! Monash University has discussed fresh cranberries on their blog and it is suggested that amounts of 130 grams per serving of fresh cranberries should be tolerated by most. This recipe uses 398 g (NOT including the garnish) and the cake is divided into 16 servings. Please adhere to recommended serving sizes. You might also want to read our article, All About White Chocolate. 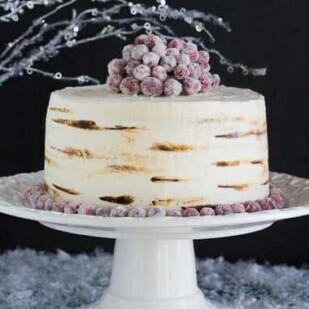 Our favorite Red Velvet Cake all dressed up for the holidays with White Chocolate and Sugared Cranberries. For the Filling: Stir together cranberries, whole and chopped, sugar and 1/3 cup (75 ml) water in a medium sized pot. Cook over medium heat, bring to a vigorous simmer, and cook until thickened, stirring frequently, about 6 to 8 minutes. Meanwhile, stir together remaining 1/3 cup (75 ml) water with cornstarch. Stir into simmering cranberry sauce and continue to cook, stirring frequently, until thick and glossy, about 2 minutes. Add butter, stirring it in until it is melted and incorporated. Remove from heat and cool before using. Cranberry filling may be refrigerated in an airtight container up to 3 days ahead. For the Cake: Position rack in center of oven. Preheat oven to 350°F/180°C. Coat the insides of two 8 inch by 2 inch (20 cm x 5 cm) round cake pans with nonstick spray, line bottoms with parchment rounds, then spray parchment. Combine milk and lemon juice or vinegar and let sit for at least 5 minutes to thicken. Meanwhile, whisk together flour, cocoa, baking soda and salt in a medium bowl to aerate and combine; set aside. Beat in the eggs one at a time, scraping down after each addition, allowing each egg to be absorbed before continuing. Add the flour mixture in four additions, alternately with the thickened milk. Begin and end with the flour mixture and beat briefly until smooth. Divide batter evenly in pans. Bake for about 30 to 35 minutes or until a toothpick shows a few moist crumbs clinging. The cake will have begun to come away from the sides of the pan. Cool pans on racks for 5 minutes. Unmold, peel off parchment, and place directly on racks to cool completely. Layers are ready to fill and frost. Alternatively, place layers on cardboard rounds and double wrap in plastic wrap; store at room temperature if assembling within 24 hours. For the Sugared Cranberries: Stir 2 cups (396 g) sugar and water together in a medium-sized saucepan and bring to a boil. Swirl pan a few times and boil vigorously for about 2 minutes or until sugar is definitely dissolved. Add cranberries, stirring them in to help coat. Let stand for at least 2 hours (and up to 4) at room temperature. Drain cranberries well - you can discard the sugar syrup or use it to sweeten tea! Spread cranberries out on a cooling rack and allow to sit at room temperature for 1 hour, then toss with remaining 1 cups (198 g) sugar to coat the cranberries. I like to use my fingers to toss them around. Spread out on clean, dry cooling rack and allow to sit for at least 2 hours and up to 1 day at room temperature. For the Frosting: Whisk together milk and flour in a small saucepan. Bring to a simmer over medium heat, whisking constantly. Once it simmers, continue whisking and cook 2 to 3 minutes or until thickened, smooth and glossy. It should be thick enough for you to be able to see definite whisk marks. Remove from heat and set aside. Stir flour/milk mixture occasionally until cool. In a medium bowl with an electric mixer on medium-high speed, beat butter until creamy, about 2 minutes. Add sugar and beat on high speed until light and fluffy, scraping down the bowl once or twice. Beat in vanilla, then add cooled, cooked flour mixture and beat until smooth. Beat in melted white chocolate until smooth and creamy. Frosting is ready to use. If the frosting is not silky smooth, it is because it is too cool. 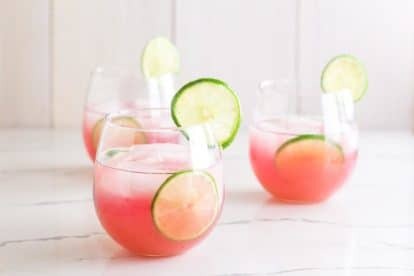 Either keep beating or remove about 1 cup (240 ml), zap in the microwave for 10 seconds to soften, then add it back to the main batch and beat vigorously. Repeat as needed. Trust me. This can make the difference between the frosting being just okay and truly ultra silky. For Cake Assembly & Decoration: Have frosting soft and ready to spread. If you want to create the birch tree-like effect as in the pictures, set aside about 1/2 cup (120 ml) frosting and tint very dark brown with food coloring. Assemble pastry bag with coupler and tip. Place brown frosting in the bag and set aside. Cut each cake in half horizontally so that you have 4 layers. The tops of the cakes might be a bit domed; that’s okay and there is no need to trim. Place one layer, dome or topside down, on an 8 inch (20 cm) cardboard round and place on a cake turntable. Cover with one-third of the cranberry filling, going all the way to the edge. Put another cake layer in place, cut side down. Add another third of the cranberry filling, then another layer of cake, cut side down. Add last of the cranberry filling then the last domed/top layer on top, dome/top side up. If any cranberry filling is exuding from the layers, simply wipe it away with your finger or an icing spatula. Apply a thin crumb coat of frosting all over the sides and top of cake. Chill briefly, just enough to firm up the frosting, then apply final coat. You can completely cover the cake, or create a “naked” look, leaving some of the cake itself exposed. The added bonus here is that you will use less frosting, making the FODMAP load less! 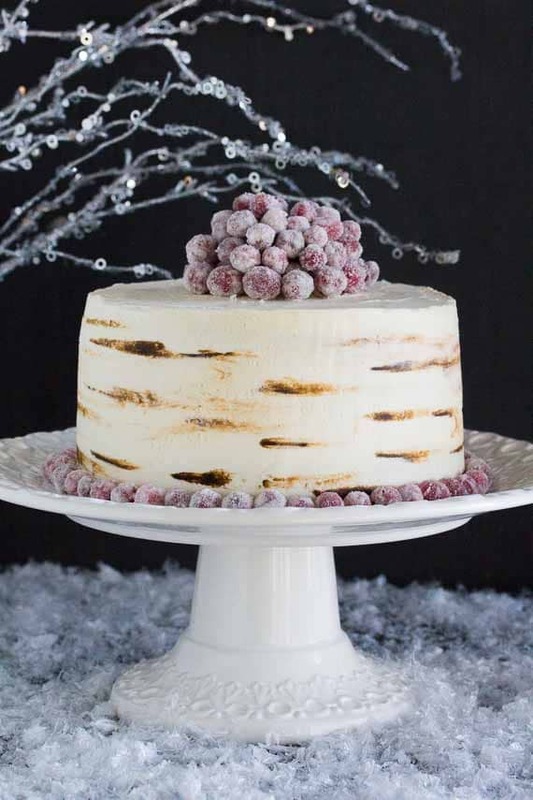 If you are making a “birch” cake, apply this second layer of frosting more thickly to create a white, opaque covering. Make horizontal lines with the pastry bag of various lengths and at varying heights around the cake. They will just look like thin little lines. Hold an icing spatula straight up and down with the blade at a very slight angle and go around cake, softening the brown piped lines and blending them into the white frosting background. Each and every cake will take its on its own unique patterns and look. 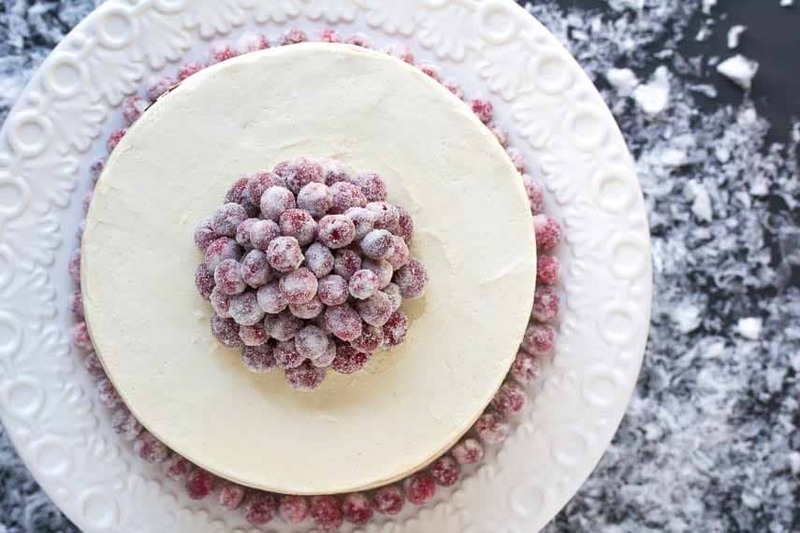 Decorate with sugared cranberries as desired as close to serving time as possible. (You can use little dabs of frosting to help the mounded cranberries stay in place). Serve cake at room temperature. 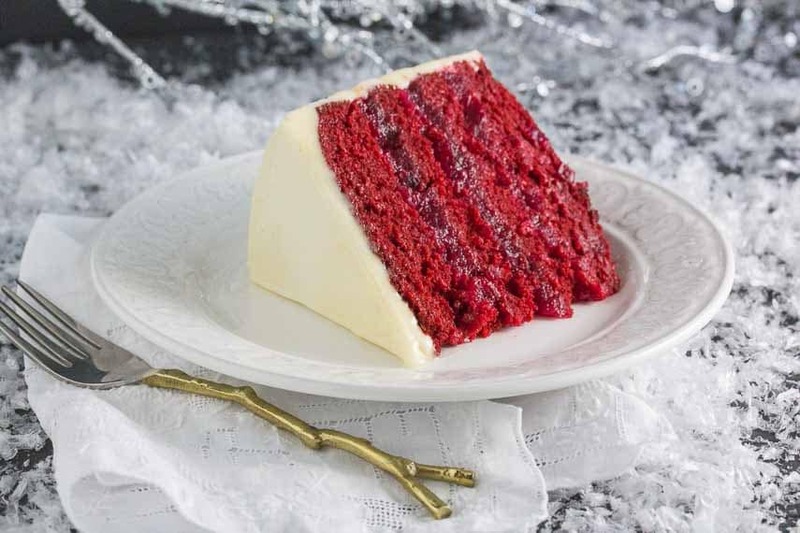 Cake, without cranberry décor, can be refrigerated overnight; bring back to room temperature before serving. Sorry but this didn’t work for me. I followed the recipe to the letter but the milk curdled and if I had used all of the quantity I would have ended up with a runny batter. The sponge crumbled and fell apart so I didn’t even bother to try and ice it. For my taste there is far too much sugar in this recipe both in the topping and and sponge mixture. Traditionally I would have used same quantity butter to sugar – this was double the sugar making it extremely hard to cream together – hence the over crumbly texture of the cake. Shame because the in the photo it looked rather nice and I had intended to bake it as a birthday cake. So sorry it didn’t work for you Sharon. A few questions come to mind. Did you use the flour called for in the measurements suggested? This flour performs very differently from any other we have tested. Also temperature of ingredients is very important – if the butter, eggs and dairy are too cold you will see “curdling”. That is definitely a temperature signal. 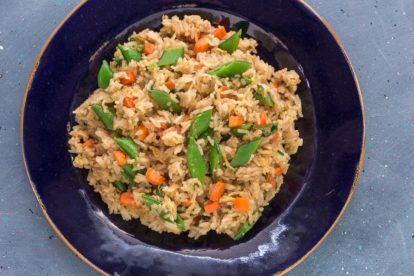 Sugar can sometimes be reduced by about 25% in many baking recipes, but that is really hit or miss and I have not tested that here. If you would like more help figuring out what might have gone wrong, I am happy to brainstorm. I have made this cake many times and have not experienced these issues.